Kena likes to kick around a soccer ball with her boys. Bubbly Ziki likes to dance with her girls. Yet when their paths cross, the two fall in love. Formerly banned in Kenya, Wanuri Kahiu’s gay romance is delightful and full of life. Kena is a teen living in the suburbs of Nairobi, Kenya. Her day-to-day consists of working her dad’s kiosk and kicking around a soccer ball with her boys. Ziki is a bubbly school girl who practices dance routines with her girls. Their paths cross, and the two form an inexorable bond. Amid a community of haves and have-nots, bullies and gossips, macho boys and flirtatious girls, they attempt to drown out the noise and find themselves starting a romance. 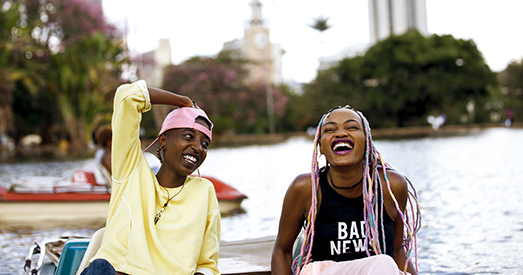 While a gay love story may seem innocuous, filmmaker Wanuri Kahiu risked everything to tell it, as RAFIKI was banned in Kenya. Yet, despite the gravity of its context within Kenyan culture, the film is as delightful and colorful as Ziki’s rainbow braids.